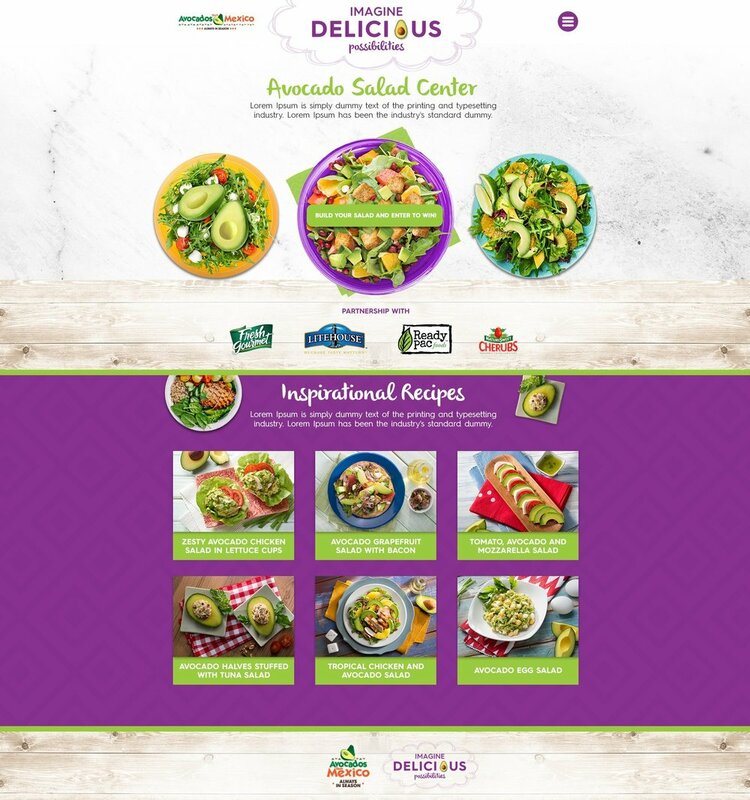 LAS VEGAS, Oct. 29, 2018 /PRNewswire/ -- Avocados From Mexico (AFM), the number one selling avocado brand in the U.S., and Chicory, the New York City-based tech company, announced today that they have partnered to provide shoppable recipes on Avocados From Mexico's recipe sites at Groceryshop. Through this partnership, Avocados From Mexico has become the first and only fresh produce brand to provide shoppable recipes with Chicory to date. Consumers now have the ability to add recipe ingredients featuring Avocados From Mexico straight into their online shopping carts at a variety of the country's leading online grocery providers like Instacart, Peapod and AmazonFresh, among others. The partnership will provide Avocados From Mexico recipe ingredients delivery to over 70% of U.S. households. The partnership marks the first fresh produce brand to join Chicory's growing list of shoppable recipe providers, and it marks a breakthrough investment in ecommerce for Avocados From Mexico. The technology can be found on Avocados From Mexico's recipe hub, where consumers can shop now for recipes like Mexican Corn Salad with Avocado. As part of its e-com initiative, the avocados brand also launched its Salads Hub, a creative digital space where shoppers can access delicious salad-making possibilities. After guacamole, salads are the #2 usage occasion for avocados and the hub provides an opportunity to inspire shoppers and expand overall consumption. To elevate the shopper experience on the hub, AFM partnered with Fresh Gourmet and the Incredible Egg. Shoppers will be able to interact with AFM, Fresh Gourmet and the Incredible Egg as they build their salad creations, additionally to shop for these ingredients online. "The salad hub is part of a 360-shopper program with in-store display support in produce and consumer savings offers further tying Fresh Gourmet and AFM together. It seamlessly takes shopping from a brick-and-mortar activation to a digital experience, blurring the barriers that for years separated both worlds in the grocery shopper's world," said Stephanie Bazán, AFM's Sr. Market Development Director. To use the platform, a shopper should simply visit an Avocados From Mexico recipe and look for the "Get Ingredients" button at the bottom of the ingredients list. They'll then be asked to enter their zip code and choose a preferred retailer. Their list of ingredients will then be sent straight into their online grocery basket for purchase. "We at Avocados From Mexico are looking forward to growing the shoppable recipes and being a part of the innovative digital grocery shopping space as we continue to evolve our digital capabilities in ways that are unexpected from a fresh produce brand," said Alvaro Luque, president of Avocados From Mexico. "These kinds of approaches, which are executed with the speed and flexibility that characterizes our organization, are what have allowed us to become pioneers in the industry in the digital space. The integration of ecommerce into our platform, through this partnership with Chicory, is more proof of our constant drive for innovation. At the same time, we stay committed to implementing the powerful in-store shopper programs that have proven to be so successful for our brick-and-mortar retail partners." Chicory uses leading-edge AI technology to decipher what is needed in the recipe. For instance, if a dish calls for a cup of diced pepper, the technology will use context clues to know to add bell pepper, and not ground pepper, to your shopping cart. "Considering that a company's innovation score is the time that it takes to act on accelerating innovations, our company's score is in the high end. We identify the need, find top-notch tech to help us address it, and implement it fast and seamlessly," said Ivonne Kinser, head of digital marketing for the organization. "We, marketing leaders, are living in a pivotal moment in which we have the opportunity to reinvent our businesses as technology continues to explode. We need to embrace that opportunity simply because the status quo is just not good enough anymore. This is the time to disrupt or to be disrupted, and we have chosen the first," said Kinser. "Seeing Avocados From Mexico's dedication to innovation has been particularly inspiring," said Yuni Sameshima, CEO at Chicory. "Over the past three years, as we have traced recipe trends across Chicory's recipe network of over 80 million monthly users, avocados have been a persistent trend—with smoothie bowls and avocado toast being some of the most notable foodie favorites. Avocados From Mexico knows this and is capitalizing on a crucial moment when their product is resonating with consumers, plus they're offering a unique way for those consumers to engage like never before. We're excited to see what we learn from this new partnership." 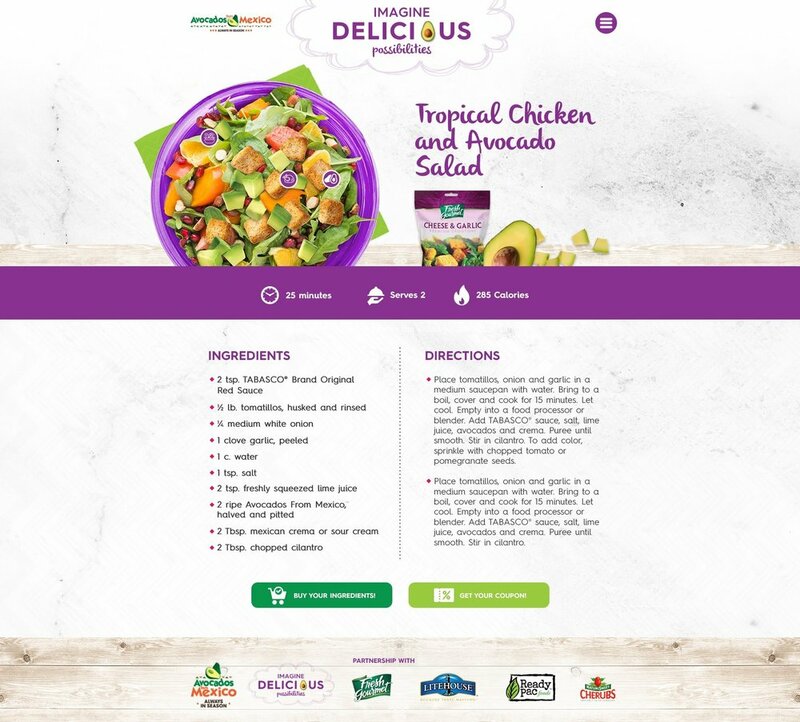 In addition to Avocados From Mexico, Chicory has partnered with companies such as Campbell's, Perdue and General Mills to provide shoppable recipe tech on their sites, in addition to their independent publisher network of over 1,000 sites. Avocados From Mexico will be the first fresh produce provider to offer recipe shopability with Chicory. Avocados From Mexico (AFM) is a wholly owned subsidiary of the Mexican Hass Avocado Importers Association (MHAIA), formed for the purpose of advertising, promotion, public relations and research for all stakeholders of Avocados From Mexico. Under agreements, MHAIA and the Mexican Avocado Producers & Packers (APEAM A.C.) have combined resources to fund and manage AFM, with the intent to provide a focused, highly effective and efficient marketing program in the United States. AFM is headquartered in Irving, TX. For more information, please visit https://avocadosfrommexico.com/. Fresh Gourmet is the premier salad topping brand, bringing innovative ingredients from leading culinary experts to retail grocery stores across the world, and offering a wide range of delicious croutons, fruits and nuts, tortilla and wonton strips, and crispy vegetables. Fresh Gourmet has a topping for any salad application, adding texture and flavor to classic Caesar salads, grain bowls, and everything in between. With a passion for bringing delicious toppings together with top quality fresh produce – find Fresh Gourmet in the Produce Department in a retailer near you. Learn more at www.FreshGourmet.com. Home of The Incredible Egg, the American Egg Board (AEB) is the national marketing organization of America's egg farmers. AEB's mission is to increase demand for eggs and egg products through research, education and promotion. AEB is located in Chicago. For more, visit IncredibleEgg.org.